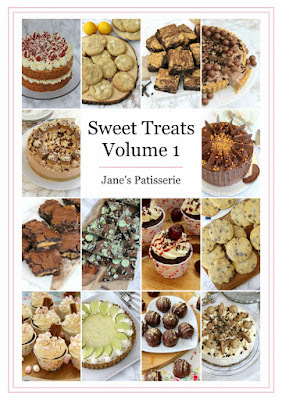 Available as a download from the Jane's Patisserie website, her new eBook ‘Sweet Treats Volume 1’ is now available to purchase! Featuring 14 exclusive recipes, it's definitely one you are all going to enjoy. Cakes, Cupcakes, Cheesecakes, Cookies, Desserts, Sweets and Traybakes are all featured, with two new exclusive recipes in each, along with two of Jane's favourites from her blog! If you haven't visited the blog of Jane's Patisserie before, you are really missing out on a SWEET TREAT or two! I can't claim to have tried all her recipes, as I would need a whole new (bigger size) wardrobe, but the ones I've tried have been simply amazing! What I love about Jane's recipes is that she uses well-known chocolate bars and biscuits to make stunning creations that you can easily replicate at home. 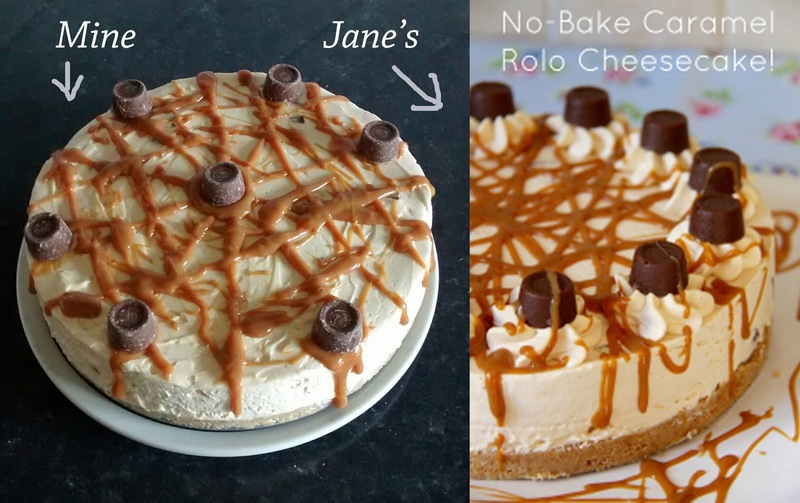 Like me, Jane is quite a fan of the cheesecake BUT Jane's cheesecakes are like nothing you have ever tasted before. For a start there is no gelatine in them; that's right, no jelly animal bits at all. So it was to my absolute amazement that with a few taps, tugs and nudges (and a panicked tweet to Jane when it wouldn't budge), that I turned out a fabulously set Caramel Rolo Cheesecake. With the strange spider web decoration, I know mine didn't look as stunning as Jane's but it tasted SO good! I've also tried Jane's Honeycomb Crunchie Cheesecake and her melt in the mouth White Chocolate and Cranberry Scones, which both turned out exactly as pictured, making me feel like the winner of the Great British Bake Off. So when I saw that Jane had brought out a recipe e-book, I just had to have it! What a little gem of a book this is, not only do you have Jane's favourite recipes from her blog, but also some exclusive recipes only available in this e-book. So what do you get in the e-book? There are 28 mouth-watering recipes, 4 in each section: cakes, cupcakes, cheesecakes, cookies, desserts, sweets and traybakes. Within each section, 2 are exclusive to the e-book and 2 are readily available on Jane's blog. So whether you prefer a traditional sponge cake with a difference or you're more of a cookie fan, then there really is something for everyone. I am desperate to try the Apple Crumble Cake (which is on Jane's blog) and the Peanut Butter Brownies which are exclusive to the e-book. Proof of the pudding really is in the tasting, so get baking today with Jane's Patisserie. Whether you're a novice baker or an experienced cook, you will awaken your tastebuds and amaze your guests with Jane's fabulous creations. Whatever your favourite chocolate bar or biscuit, Jane is sure to have a recipe to delight you and fit every occasion. I couldn't count on my fingers and toes the amount of times I have recommended Jane's blog to my friends and family. I will always turn to Jane first whenever I want to make something special or different, with minimal fuss, clear instructions and perfect results. So please do make sure you visit Jane's blog to purchase her Sweet Treats Volume 1 e-book today! Sold as a digital copy only, buy it now from Jane's website by clicking HERE! Do make sure that you follow Jane on Twitter, Facebook and Instagram, then go out and buy some stretchy pants because you're gonna need them!